In the aftermath of the Atimonan Massacre that saw 13 persons dead, attention is now focused at the Palace as to who is the well-placed protector of one of the deceased, Vic Siman. 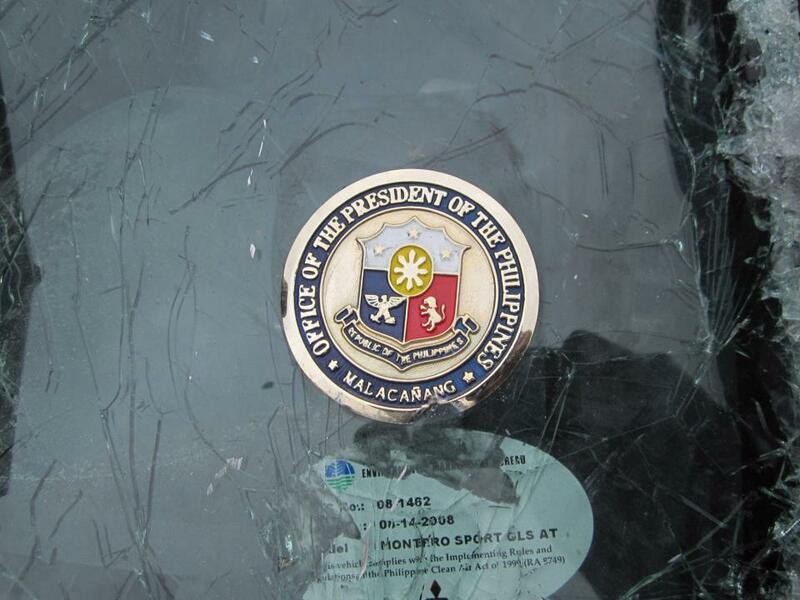 In one of the pictures taken by the NBI and the media, the Montero SUV where Siman was found dead sported a Malacanang Palace decal, proof that he has access at the Office of the President. The Laguna Province Small Town Lottery franchise holder Ramloid Gaming Corp is owned by Don Ramon Preza of Tiaong, Quezon. That of Quezon Province STL is exclusive to Pirouette Gaming Corporation owned by Dona Rosario “Charing” Lee Magbuhos de los Santos and because of failing health is now operated by Eddie “Kabayo” Gonzalez. Sometime on July 7, 2011, Preza was ambushed and critically wounded in an assassination attempt while traversing the Maharlika Highway towards Tiaong, Quezon. Per Dona Charing’s instructions and strictly enforced by Gonzalez, there shall be no bookies operating in Quezon and if there are, these are with the knowledge of the duo and provided management fee is settled. In the case of Laguna, bookies operators abound with or without the blessing of Preza. Enforcement of the exclusive franchise in Laguna especially in San Pablo and Calamba is problematic. Politicians dip their fingers as when the neophyte solon Dan Fernandez harassed Preza into submission, a ploy of introduction to iron out the monthly intellegencia for the congressman. There are a number of bookies/jueteng in operations in Laguna foremost is that of Vic Siman and one Senen “Tita” Dinglasan. Provided that the bookies owner pays a monthly management fee, there will be nary a whimper from the franchise holder. Bookies are the perennial excuse by the franchise holder in their understating the monthly gross take in their monthly report to the PCSO. The opposite is different. Where a bookie is not allowed, its operation dries up the daily engreso. Tita Dinglasan has the mini-franchise extended by Preza. That of Siman has none. Siman was allied with Kabayo, the latter setting his sight to grabbing the two jueteng crown jewels of CALABARZON. Laguna and Quezon have a combined monthly engreso of P100M. Go figure the monthly net and the amount of Intellegencia especially set aside for national and local protectors. There is no doubt that the men at the DILG (Jesse Robredo and Mar Roxas are both Messrs. Clean), except a former UnderSecretary, have nothing to do with jueteng and STL. But with the advent of the PCSO Loterya ng Bayan, the story is never the same again. The extension of contracts of STL operators were signed during the dying days of the Arroyo administration. In its place, the PCSO has devised the Loterya ng Bayan originally envisioned to be operated jointly by the local government and a private management entity to be licensed by the agency. Finding the system to be unwieldy, the PLB was finally revised hewing closely to STL operations but at a smaller scale: franchise shall be awarded per congressional district instead of per province. The idea is to micromanage the lottery. Control is easier enforced with small gaming companies. Those are the ostensible philosophy. The real reason behind the PLB however is to revoke existing STLs which benefitted their former patrons and are still hunky-dory with dynasties identified with the Arroyos. With the Liberal Party in the saddle, it is in the lookout for wherewithal. The PLB is the solution. Thus, all STLs operated by the Pinedas, Magbuhos, Prezas, are up for revocation. Otherwise, the LP does not stand a chance. Money, not the Daang Matuwid, is the brute reality of politics. By July, 2010, the STL operators found a friend with one Rico Puno of the DILG. By February, 2011, the PCSO has finalized the Rules of PLB. Some STL operators emboldened by Puno’s latent support, protested and yet as insurance organized new corporations and availed of the new rules by applying for a new franchise at P50,000 per application. By June, 2011 there were about 200 applicants. Chairman Margie Juico began screening the new applicants ascertaining that they don’t have any link with the Pinedas and company. That was the minimum requirement from the President. “The PLB should start with clean slate.” Aside from Puno, the STL operators found sympathetic ears from the Office of the President. Rightly so, because regular Intellegencia freely flowed from the jueteng operators to the Palace. Whether the President is aware of this arrangement is not known. One lawyer at the OP was heard saying, “kung ibinibigay na hindi naman natin hinihingi ay tanggapin.” Right now, the Rules of PLB are in the OP freezer. The longer it is released or none at all, the better for the Intellegencia recipients courtesy of Pineda-Preza-Magbuhos-Kabayo and company. If the local governments and the Police have their share of the Intellegencia, the OP personages should not be denied. Kabayo Gonzalez and Siman have access to the Palace. That explains the Malacanang gatepass and access of Siman. Trinidad and Preza complained of the encroachments by Siman and Kabayo, but their pleas fell on unusually deaf ears already spoken for by the latter. Trinidad and Preza were never remiss in their remittance of their share to the OP brokers. The Palace operatives played coy. They did not make it known that they were playing footsies with Siman and Kabayo. Enter Supt. Hansel Marantan, a member of Freemasonry and with several notches tucked under his belt of 27 recorded hits all fatal. What’s 13 more to round it up to 40, to the consternation of Mar Roxas. While it is true that Marantan alerted Sec. Paquito Ochoa (as crime czar and head of the newly organized Presidential Anti-Crime Task Force) about the operation, the latter perfunctorily rejected its enforcement having recognized the object of the hit: Siman, a pain in the neck of Preza. No alarums sounded. To Ochoa and company, Preza and Siman are nothing but pack of wolves out to devour the jueteng carcass of Laguna. When Ochoa turned down Marantan’s Memo, the police officer did not sulk. Instead he sought out PSupt. Ramon Balauag, chief of Intelligence of Quezon PNP and Lt. Col. Monico Abang of the Special Forces Battalion of the Philippine Army. How is Marantan related to these officers? They are members of Freemasonry as well. “Ang mga Mason, nagbibigayan. Kapag humingi ng pabor ang kapwa Mason, pinagbibigyan. Ganun ang kanilang samahan.” Marantan also sought the blessing of Senior Supt. Valeriano De Leon, Quezon Province Police Director. Shortly after de Leon assumed his post as Quezon PD in the early part of 2012, he was gifted by Marantan of an “accomplishment record” of killing in another purported shootout behind the Pacific Mall in Lucena City of 4 hardened criminals. Where to stage the ambush of Siman and company? Atimonan is the most ideal because Atimonan Chief of Police Chief Insp. Grant Gollod is a long time subordinate. Marantan could not stage the shootout in Pagbilao, Lucena, Sariaya, Candelaria, and Tiaong because by this time the Chiefs of Police of these LGUs are not “close to him,” according to the source. Brgy. Talaba in Atimonan is a lonely uninhabited 2-kilometer stretch of road of the Maharlika High Way. The HGV Resort has long been abandoned and was foreclosed by the banks. The alleged shoot out in Candelaria, Quezon in February, 2010 resulted in the death of 8 men aboard a Toyota Hi-Ace. It turned out later that these men are employees of Siman in his jueteng operations in Laguna. One of the fatalities in the Atimonan shooting was Gerry Siman, a brother of Vic Siman, who filed a case of multiple-murder against Marantan in a Quezon court. With Siman eliminated, what remains is the rivalry between Kabayo and Preza. Who will be favored by the gods of Malacanang still remains for us to find out. Senen “Tita” Dinglasan it turns out is a sibling of Marantan, an operator of bookies within the turf of Preza in Laguna, a direct competitor of Vic Siman. The source says, “sabi ni Tita, bakit hindi nila patigilin si Vic, eh nagbabayad naman kami ng obligasyon namin ng walang aberia.” It turned out that Vic boasted of his connection in high places.